The choice of the ideal analgesic and anesthetic technique in patients with neurological and neuromuscular disease should be based on thorough antenatal assessment, severity of the disease, and individual risk-to-benefit ratio. Regional techniques are widely used and provide significant advantages in obstetric patients with pre-existing neurological or neuromuscular disorders, but occasionally they may be contraindicated or technically difficult. Whether regional or general anesthesia is offered, it is imperative that the anesthetic management involves a cautious approach and avoidance of the drugs and factors with negative effect on the mother and the fetus. 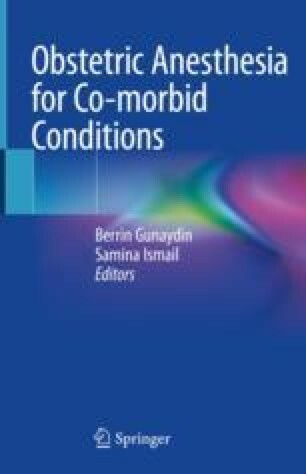 The objective of this chapter is to review the most common neurological and neuromuscular conditions affecting obstetric patients with a special emphasis on their anesthetic implications. RCOG. Epilepsy in pregnancy. Green-top Guideline No. 68, June 2016. https://www.rcog.org.uk/en/guidelines-research-services/guidelines/gtg68/.